One month ago, I was hitting my peak mileage and running more than I have in my life. I was following my college cross country training plan, and logging 75 miles in one week. In addition to daily and twice-daily runs, I went to the gym every other day to keep up my strength training with either free weights or a group fitness class. I was in the best shape of my life, working extra hard because I knew what was coming: time off. The surgery would take me out of training for about 3-4 weeks, and the timing was unfortunate. Right in the middle of summer training is where we runners build our base and endurance. I know that 3 weeks of zero exercise will put me at a huge disadvantage when I am able to return to the sport, but I am doing everything my doctor will allow me to do in the recovery time. 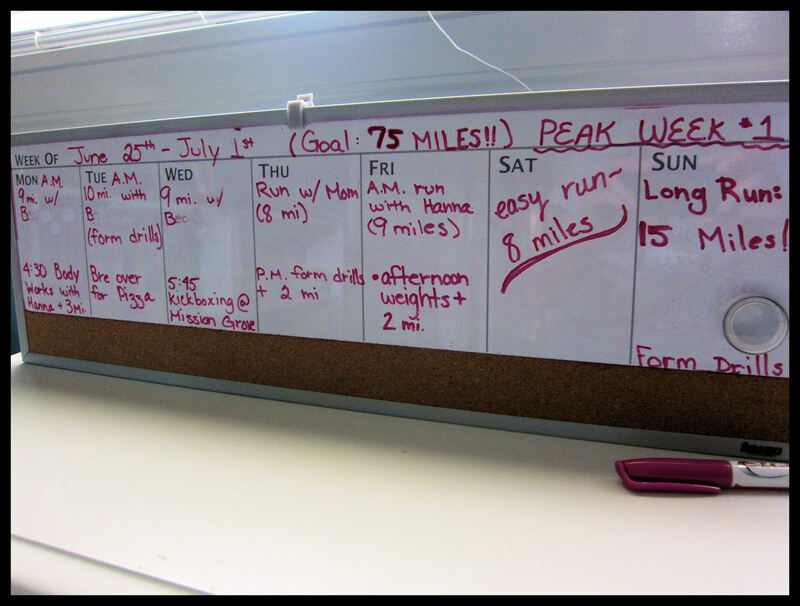 One thing that I have found helps me with sticking to my workout is writing out a weekly plan and committing to it. It’s so easy to wake up in the morning and let your pre-coffee laziness lower your expectations for the day’s workout and hit the snooze button. But something about having the calendar sitting on my night stand (reminding me what I have already set out to do today) is really a motivating factor in completing every workout I planned or my coach planned for me. Obviously another factor in the drastic change in physical activity is my diet. I went from burning about 1000 calories a day to closer to 200. Therefore, I really needed to cut out extra desserts and snacks that I could get away with before. Even though my exercise has decreased, my appetite has not so I will definitely have to be diligent about squashing snack attacks. Writing out your training plan is also a great way to look back at what you accomplished and helps motivate you to continue your success. If you see what you’ve accomplished already, it will boost your confidence that you can do it again.